PLEASE INQUIRE FOR AVAILABILITY AND RATE. 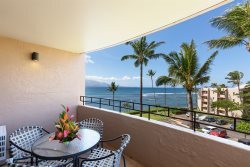 Stunning beachfront 2 bdrm (1 king, 1 queen) 2 bath completely remodeled luxury condo directly on one of the nicest beaches on Maui. Sugar Beach has soft white sand, great swimming, paddle-boarding, kayaking, canoeing and many other activities. During winter the Whales will be just outside your door playing in the water. This ground floor condo is directly on the beach where you can swim and walk for miles. The complex is within 10 minutes to Kihei town where you can get supplies, enjoy other activities and got to Happy Hour. The unit was completely remodeled floor to ceiling in 2017 and includes 2 bedrooms each with en-suite bathrooms, a full luxury kitchen, living area with large screen TV, wireless internet throughout, central air-conditioning or if you prefer the tropical breezes there are ceiling fan in every room providing everything you need to have a wonderful relaxing vacation. It is the largest unit in the Nani Kai Hale complex with 1100 sf and boasts a 10x30 patio with 2 sliding glass doors 1 from the living room and 1 from the master bedroom. It has floor to ceiling widows displaying breathtaking views of the beach and ocean from the kitchen, living, dining and master bedroom areas. You can literally step out your door and onto the beach and walk for up to 5 miles unobstructed enjoying the calm warm waters or just walking in the sand watching the outriggers canoe by or enjoy the large pool right next to the condo. In addition the grass area between the condo tha beach has lounge chairs, umbrellas, seating areas and BBq's to further enhance your stay. This beach is quiet and mostly underpopulated so crowds will not be an issue. The area is central to Maui and provides easy access to Kihei, Wailea and Lahaina all within 30 minutes drive providing access to the endless activities around the island. If you are in town to get married the Sugar Beach wedding venue is close by within walking distance. The complex is on a dead-end road so no traffic to worry about and plenty of parking for your stay with easy access to the Piilani Hwy which will get you to and from then airport in 15 minutes. This is the type of place you will want to return to year after year as it is truly a piece of paradise in paradise. The owners John and Laury and the on island manager take great care to ensure the condo is equipped with everything you need and that it is updated and very clean. No need to bring beach towels or buy expensive beach chairs or a beach umbrella as those are provided along with a beach cooler. In the morning you can step out onto the patio and sit at the private table to have your coffee and enjoy paradise. We absolutely love our place and think you will love it too so book your trip now and enjoy this piece of paradise.